One aspect of Stearns’s design-art practice, which uses the media of light and sound as raw materials, involves repurposing, appropriating or creating systems that he then ‘glitches’. The compelling images that result constitute the visual residue of those glitches, which can have an unexpected beauty. Stearns’s work both reflects and advances the significant influence of digital technology and culture upon 21st-century aesthetics, yet there is also a close connection to twentieth century art and nineteenth-century textiles. 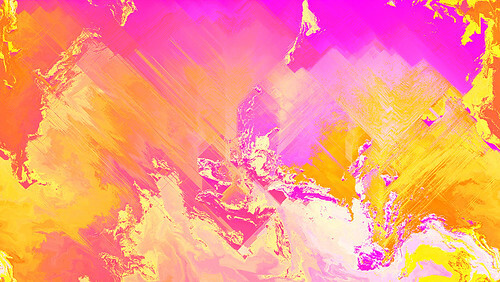 Right and top: Digital abstract art from Stearns’s series ‘aYearInCode();’, 2015. Stearns’s earlier 2012 (and ongoing) project ‘YearOfTheGlitch’ catalogues a series of formal studies concerned with digital processes and the expectation of what those processes can do. 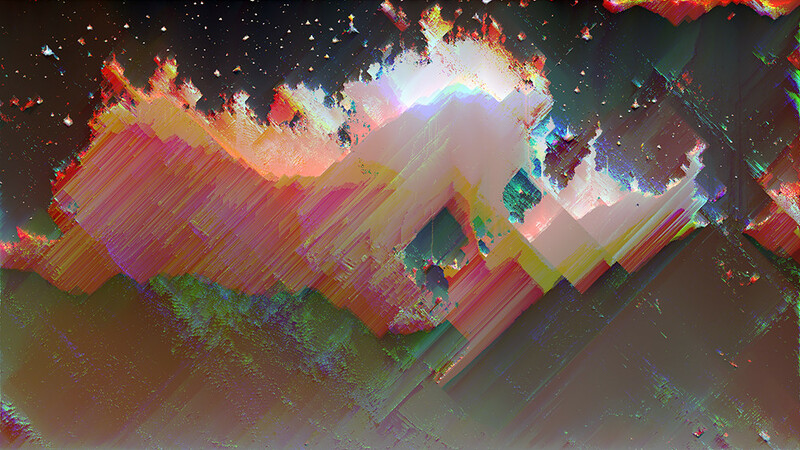 ‘YearOfTheGlitch’ purposefully riffs upon the notion of glitch art as the aestheticisation of digital artefacts. By experimenting with data in unconventional ways, Stearns’s methods and techniques in ‘YearOfTheGlitch’ are about ‘pushing a system to point where it gives back more than you put in’. His current project, ‘aYearInCode();’, develops these ideas further. Informed by artificial life, cellular automata, physics simulations, and flocking algorithms, Stearns observes that ‘aYearInCode();’ is centred around ‘the aesthetics of simulation’. Working directly with crafted algorithms ‘aYearInCode();’ uses creative coding practices to manipulate pixels, subverting and reformulating contemporary and historical images in suggestive ways. Phillip D. Stearns’s woven throw blanket DCP_1997. 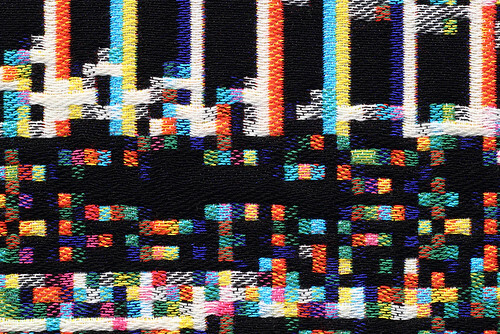 Detail from Fragmented Memory from the Glitch Textiles collection. 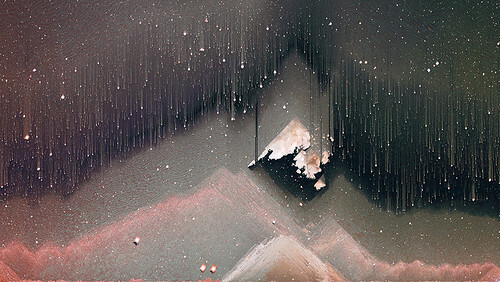 A photograph recognisable as a landscape from earth or a spacescape from Hubble can pixellate and melt into a surreal, uncanny dreamscape; portraits fragment into pointillist-like paintings reminding us that how we see (in a physical sense) and how digital images are created is a process of light recognition, whereby a myriad of reflected / projected moments generate the illusion of a whole; Pop cultural images become animated and warped, blurring the representational into the abstract and looping back again; while Renaissance masterpieces are displaced and reconfigured in a knowingly postmodern way. Stearns’s blog post featuring a reworked picture of Michelangelo’s David is playfully titled Technologia Obscura, signposting the connection between his work and the history of image-making (including the transfiguration from 3D to 2D) by indirectly referencing the camera obscura and replacing the darkened chamber of that particular tool with the ‘black box’ of digital media and code used to experiment with glitch. According to the Oxford English Dictionary the etymology of ‘glitch’ is currently unknown but it describes ‘a surge of current or a spurious electrical surge’ and, in extended usage, relates to ‘a short lived irregularity in behaviour’. Having an unknown origin seems appropriate to an effect that is usually experienced without warning, perhaps most frequently when a digitally mediated image distorts into a picturesque mosaic of blocky pixels. When this happens to a television signal, interactive screen, video game or other media the effect is often strikingly beautiful. This is, in part, because it is an error encountered by chance that makes us see things differently. 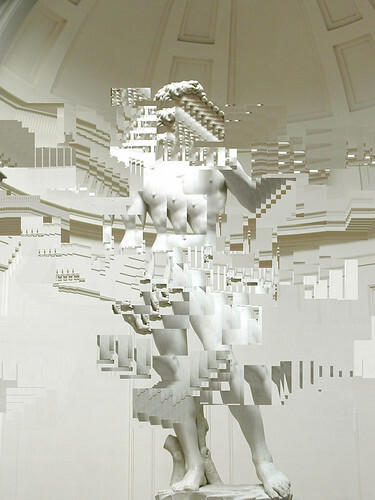 Despite (and perhaps because) a glitch can force an unexpected pause or subversive moment it appears similar to the form of beauty explored by the Surrealists, whose collages and assemblages of disposable paraphernalia from mass media and urban capitalism transcend their mundane origins to become something unique. Created by chance finds and idiosyncratic arrangement, collaged ephemera and other disposable snippets of life become greater than the sum of their parts: their unpredictable composition transforms their content. Exploring this type of unexpected beauty as part of the creative process is one of the defining characteristics of twentieth century art. In addition to Surrealism and Cubism, a selective and highly fragmented lineage might reference Dadaist and Futurist painting and poetry; John Cage’s experiments with sound; the Fluxus artists, particularly Nam June Paik; William Burroughs and Brion Gysin’s ‘cut-up’ technique; Gerhard Richter’s blurred paintings; Andy Warhol’s inclusion of frame flashes on over-exposed film; and Gustav Metzger’s auto-destructive art, to name a well known handful who are precursors and / or contemporaries to the wide range of visual and musical artists who have been working with chance and dynamical systems for the past five or six decades. Although initially appearing to share certain similarities with twentieth-century art, Stearns sees contemporary glitch art as distinct from the past because it specifically ‘appears with the advent of ubiquitous digital technologies’. 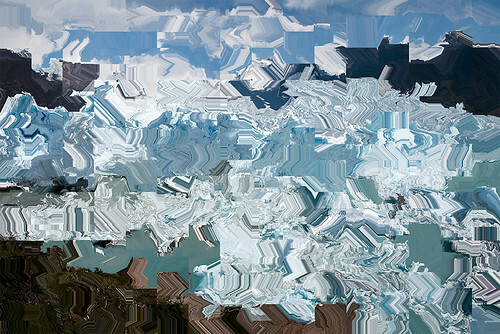 To make an important conceptual distinction, glitch art is about exploring digital technology and culture rather than the materiality of a specific medium. Initially developing out of sound experiments within the music scene in the early 1990s, the glitch as a creative artistic practice is more properly aligned with 21st-century art and design. 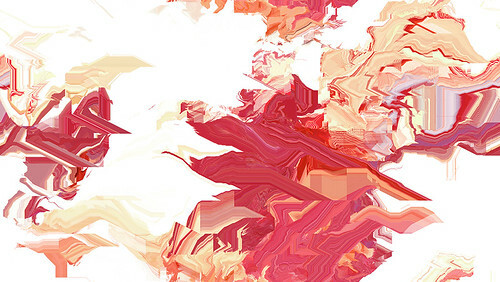 A film showing the processing, made with vectorDrift, for Phillip Stearns’s Meat Melt, 2015. 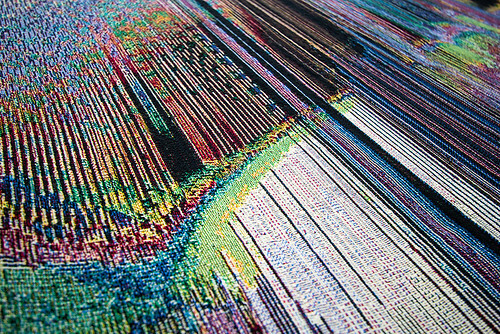 Stearns’s awareness of the evolving relationship between the material and the digital is evident in his design label Glitch Textiles, which aims to bridge ‘the digital / virtual divide while simultaneously connecting histories of woven image making and computer technologies’. Launched in 2011, Glitch Textiles appeared in the Dior Cruise 2015 collection and is part of the ‘glitch couture’ trend. 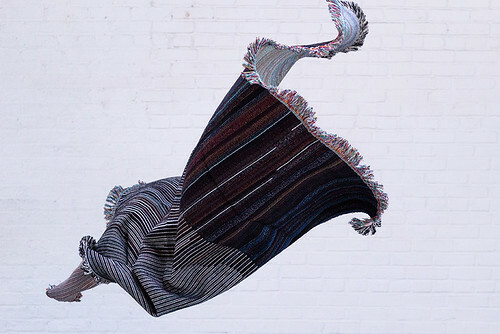 By reconfiguring digital designs back into a literal and material form, Stearns’s textiles remind us that woven fabric and garments can flow, wave, stretch and compress with as much beauty and dexterity as electronic media. 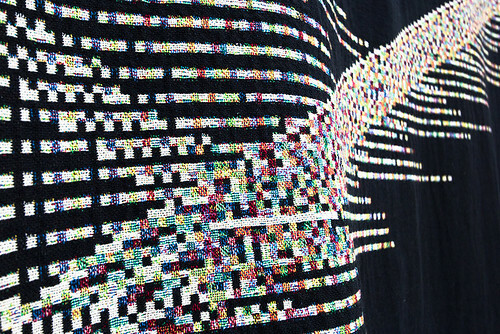 Engaging with textiles in this very human and physical way, Glitch Textiles subtly allude to the ‘networked nature of our postdigital lives’. Conceptually these designs draw upon the rich heritage shared by computers and the loom [see ‘Magic box: craft and the computer’ in Eye 70]. The extraordinary complexity of the weaving process, layering and building pattern and form through the warp and weft, gave rise to the Jacquard punch-hole card system that became the foundation of modern computers. Digital media evolves from this early form of programming, which automated a hand-design process into an unprecedented simulation of machine-stored memory. When a designer works by hand there is always an element of uncertainty regarding the final form because people are not flawless, monotonous machines. This brings with it the unpredictable beauty of a unique process. While Stearns’s work embraces certain types of digital control, his glitch-based aesthetic across electronic and textile media ensures the essence of unexpected beauty remains central to his post-digital practice.